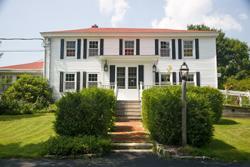 The Sedgley Place is conveniently located just off Rt. 202 in Greene, Maine. We are just a 10 minute ride north of Lewiston - and just over 20 minutes from Augusta. From the Veteran's Bridge go east on Rt 202 towards Winthrop about six miles. Pass St. Francis Church on the left, then look for the cemetery on both sides of the road. Turn left on West Main Street after the cemetery than make an immediate right. Keep left at the fork in the road ahead. We are the second building on the left.